Anything where I have to learn something new is interesting, even if it's totally technical. If I learn about a medical condition, an area of law, whatever, it can be interesting. Things that are just a drag - for example, a will or a birth certificate or anything repetitive or banal is the boring stuff. I don't necessarily get paid more for the boring stuff or less for the interesting or fun stuff. However, if a project is neither fun/interesting nor decent-paying, I am much more likely to turn it down. 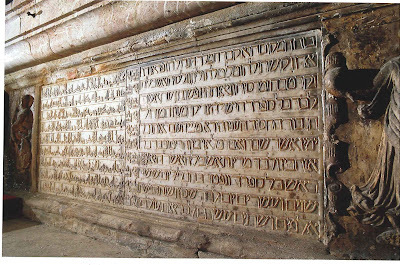 The Hebrew panel that you see here is an inscription from the tomb of Fernando (Ferdinand) III, King of Castille and Leon in the early 13th Century. His tomb contains inscriptions in Hebrew, Latin, Arabic, and Castilian. This place is the tomb of the great king, Don Fernando, Lord of Castille and Telitala [Toledo] and Leon and Valesia [Valencia] and Asvila [Seville] and Karteva [Cordoba] and Murcia; and his soul lives well in the Garden of Eden; who captured all of Spain; the upright, the righteous, the anointed, the tower, the mighty, the pious, the humble, who feared God and served Him all his days; who broke and destroyed all his enemies and who elevated and honored those who adored him, and who captured the province of Asvila [Seville], which is the head of all Sepharad [Spain] and died there on the night of Friday, the twenty second day of the month of Sivan, in the year five thousand and twelve from the creation of the world.